Guitar Gear Acquisition Syndrome: My attenuators collection. Weber "Mega Dump" - 200w. Designed for 8 ohms, may be used with 4,16 ohm amps. 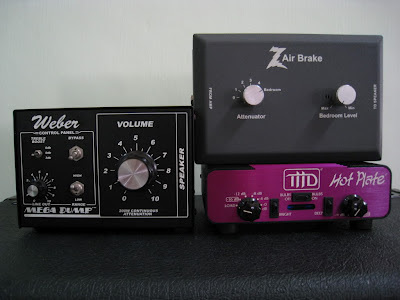 Dr.Z "Air Brake" - 100w. Users can use it with a 4, 8, or 16 ohm amps. THD "Hot Plate" -100w and 8 ohm model. My favourite attenuator is THD "Hot Plate". The simple circuit inside the Hot Plate. by high attenuation level with larger wattage tube amp. "Light bulbs" feature noise reduction which is subtle.